So says Richard R in edited excerpts from his article* as posted in its entirety on Seeking Alpha. Lorimer Wilson, editor of www.munKNEE.com (Your Key to Making Money! ), has edited the article below for length and clarity – see Editor’s Note at the bottom of the page. This, and the preceding paragraph, must be included in any article re-posting to avoid copyright infringement. Which of these 3 market gets hit first during a financial crisis. The duration of the sell-off of risky asset classes, such as SPY and GLD. The time it takes for U.S. bonds to rise drastically and then return to normal levels after a great flight to safety of bonds takes place. It´s a common myth that gold is a “safe-haven” because of its limited quantity and other qualities that gold bugs would love to tell you all about [Read: If You Don’t Think Gold IS a ‘Safe Haven’ Then You Don’t Know the Meaning of the Term!] but GLD has proven quite the contrary, being the first market to be hit by the 2008 financial crisis [Read: Why Does Gold Fall When Financial Crises Worsen?]. When the perceived risks are high, commodities get sold first. The sell-off…started in late July 2008, and was the first sign that something was not right. 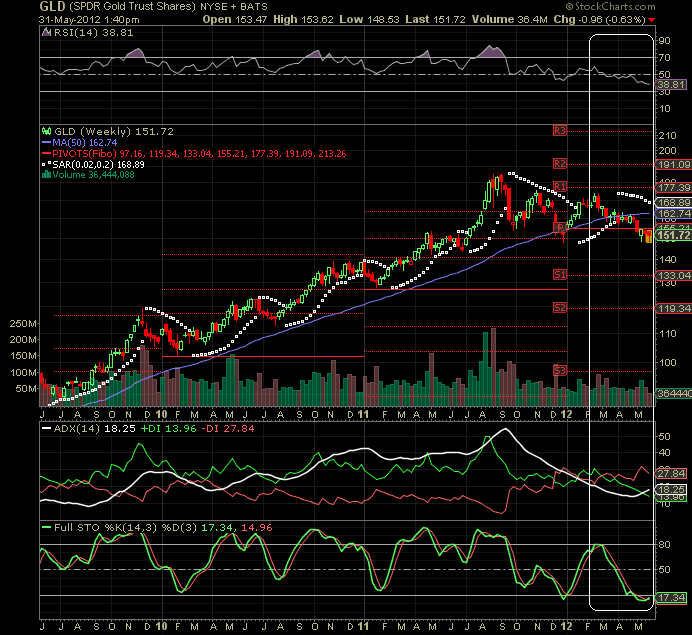 As seen on the chart [below], GLD bottomed on November 2008 (4 months before equities did), and started a multi-year bull market that [looks] to more than double its 2008 low. [As can be seen in the chart below] SPY´s first big weekly decline happened during the first weeks of September 2008, 2 months after GLD started its decline. If you had exited long SPY positions in late July 2008 when GLD was being sold-off, you would have spared yourself a -47% impact to your portfolio. U.S. bonds were not useful for timing the beginning of the GLD and SPY declines, but were very useful for timing the end of the equities and commodities sell-off. The bond market was the last of these markets to react. Participants were scared of falling prices in risky assets such as Gold and U.S. equities , so they sold these risky assets and then rushed to buy bonds…. 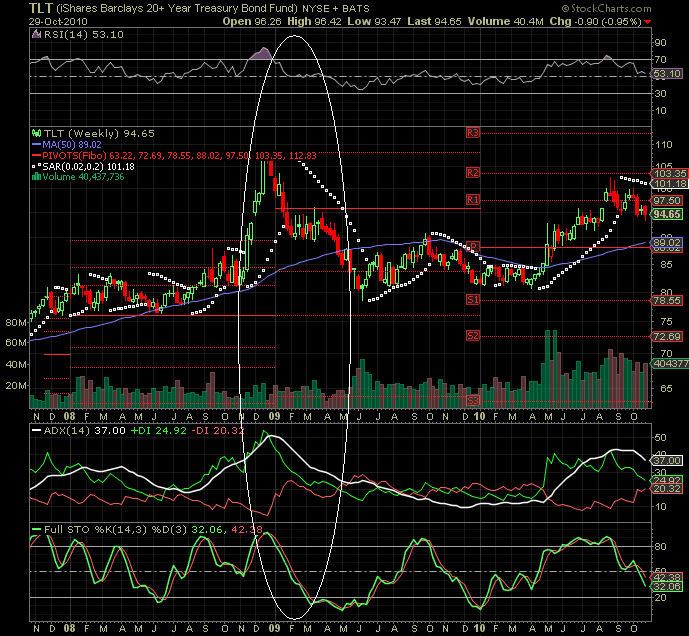 [Infact,] TLT made a 30% move to the upside from mid-November to mid-December. A month is all it takes for panic to get prices to ridiculous and unsustainable levels. After reaching record-highs, bond prices kept falling from mid-December 2008 to March 2009; returning to levels seen before the flight-to-safety sent bond prices soaring. The timing was perfect. This decline in TLT prices by itself gave a big buy-signal, money was moving from bonds back to risky assets such as SPY and GLD, which started a multi-year rally for these 2 ETF´s. The risk trade was on. What are these 3 markets saying now? A 15% decline in GLD that started in mid-February [see chart below] is the first warning sign that a sell-off in bonds and equities is starting again; especially now that GLD broke its 50 week moving average (WMA) (blue line). This had not happened since (care to guess? ): August 2008. 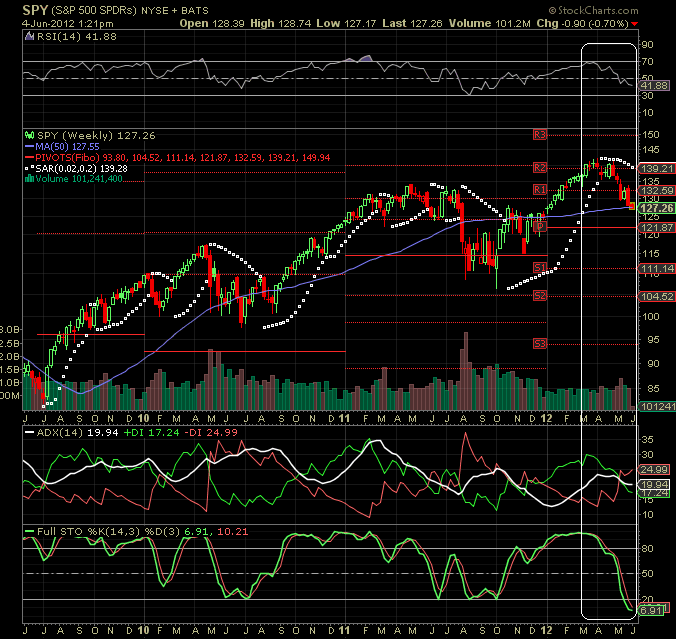 Is it SPY´s turn to fall? The big decline I am expecting…has not come yet, but is so close you can smell the fear about Europe´s final resolution regarding the “Grexit” and Spain’s…need to be bailed out by the ECB [Read: 4 Reasons Europe is a Major Risk for U.S. Stocks] which are, …among many other economical, political and war-related problems, [things that] Mr. Market does not like. 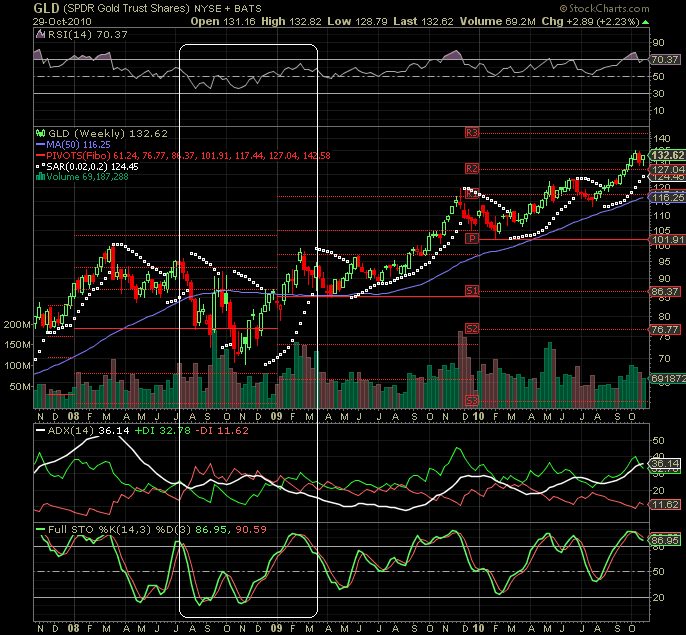 The most obvious trade right now would be: shorting SPY, going long GLD and shorting TLT. 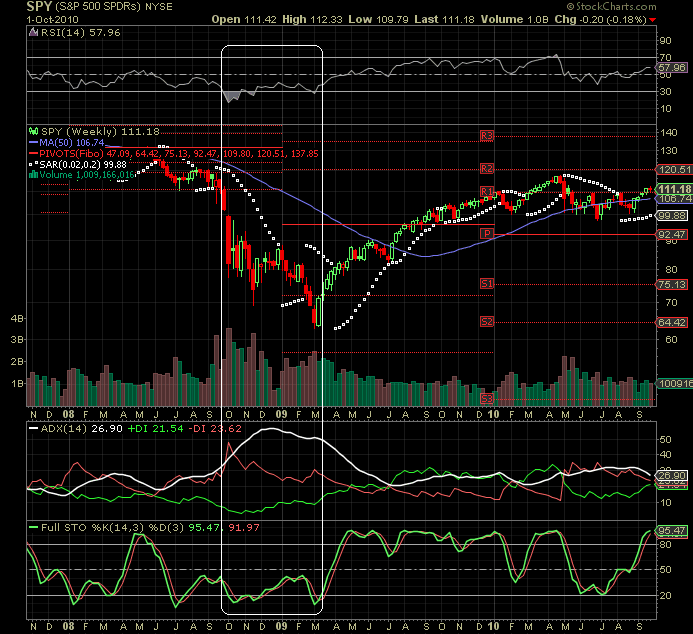 The timing is trickier though, as this sell-off is young and will need another 2-6 months to play out completely. 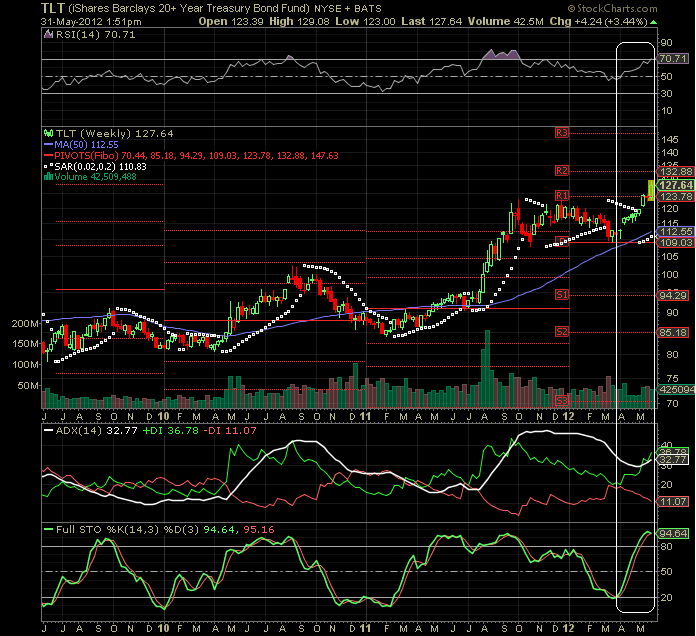 when TLT returns to around 110 – 115, exit this short trade and go long SPY, which should be around 110-120 [by that time]. Remember that bear markets give you opportunities to get on the long side with risk/reward so attractive that you will not get the same opportunity again for years…. I do expect this sell-off to be of less magnitude than the one in 2008 (that is why my targets are not lower than 100), as many of Europe´s woes are already known and various scenarios appear to be somewhat baked-in…. [Now] is the time to watch these 3 markets closely [and act appropriately when the markets so dictate]. 1. If You Don’t Think Gold IS a ‘Safe Haven’ Then You Don’t Know the Meaning of the Term! 2. Do Recent Gold & Silver Correlation/Return Comparisons With S&P 500 Refute Their Safe Haven Status? 3. Why Does Gold Fall When Financial Crises Worsen? 4. Gold as a Safe Haven is Worthless! 7. These 48 Stocks Performed Best in Previous 4 Market Corrections/Crashes – Should Any Be In Your Portfolio? A top analyst at Citibank has told King World News that global stock markets are set to plunge 27%…the panic will move global bond markets to extreme levels, but gold will remain firm. Next European Union Will Collapse Before the End of 2012: This is NOT Doom & Gloom – This IS Reality!